It has been sometime since I have covered The Skeptic Zone podcast hosted by Richard Saunders. Pennsylvania's own Sharon Hill was interviewed on the latest episode, and I thought it time for me to check in. The episode clocked in around an hour and had three main segments. The first was an interview with Sharon Hill, the second was a discussion of Reasonable Hank's efforts to catalog nurses and nurse-midwives who are anti-vaccination, and finally, an interview with Ben Radford. Hill's segment was mainly announcing the revival of Doubtful News after she had put the site on hiatus during the Spring of 2016. Hill shared that at the time she thought she had shuttered the site for good, or at least had no plans to update it. However, Hill shared how a skeptic has to skep, and she found herself drawn to starting writing again. Hill also discussed plans for the National Capital Area Skeptics to host a skeptical ghost tour this October. I suspect will not exactly be in the mold of ghost tours I have taken in Gettysburg, PA. Hill also touched upon the recent Evil Clown epidemic making the mass media rounds recently. She discussed how she began to feel burned out maintaining Doubtful News as the amount of woo woo is unrelenting. She further hinted at a new Doubtful News project. Overall, it was a good segment although it felt a bit rushed. I am not sure if that was just in the editing or if the time difference between the East Coast of the U.S. and Australia compels one of the party to get through the discussion so someone can get to bed. The segment on anti-vaccination healthcare workers was a bit depressing. Here we go again. Saunders shared some quotes by various nurse and midwives with regurgitating the same of pile of nonsense regarding anti-vaccine tropes. This is one of those areas that I just do not think will fade away any time soon. Reasonable Hank has performed some solid work just cataloging all the claptrap. The final segment was with Ben Radford who is a skeptical investigator and author of countless articles and books involving the paranormal and Fortean. 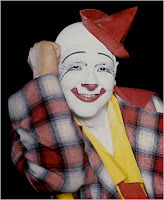 Radford, as luck (for him) would have it, has recently authored a book entitled Bad Clowns. Radford gave a brief history of the topic of creepy clowns* and the state of the current clown reports and his thoughts on the topic. A recurring theme in my mind during all three segments is that there is very little new under the sun. Bad Clowns date back to at least the 1980s. Ghost and paranormal searching and hunting date back to the 19th century. Anti-vaccination proponents just do not seem to go away, and it can all get a bit tiresome. Thus leading to folks such as Hill taking a break, and to frankly myself. Yet, there is good news. Doubtful News is back and badass as ever. Dr. Stuart Robbins is releasing new episodes of Exposing PseudoAstronomy at a steady clip. His latest two are quite good. Episode 146 recounts the numerous failed predictions regarding the return of and/or coming of Planet X by Marshall Masters. Dr. Robbins, by stacking all the failed predictions right up against each other in sound bites reveals Masters as not much of a master when it comes to Planet X. In Episode 147, Dr. Robbins systematically breaks downs David Icke’s claims that the Earth is hollow. One of my favorite books is Jules Verne's Journey to the Center of the Earth, but it's a novel. Dr. Robbins is almost as entering as Verne. Also, it is easy to take for granted efforts of Richards Saunders with the Skeptic Zone, Dr. Novella with The Skeptics’ Guide to the Universe, and Brian Dunning with Skeptoid that have been churning out material for years without fail. Their consistent efforts whether one listens to them regularly or not give a common binding thread to the entire fragment-filed skeptical community. Such steady efforts are often just taken for granted. I salute them. *I am not a fan of clowns.